The sensation of clogged, full, and troublesome ears can be distracting and annoying. 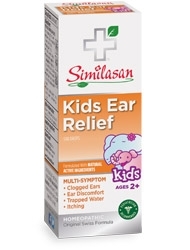 Get temporary relief for your symptoms with Similasans Ear Relief homeopathic ear drops. Ear Relief ear drops help clear water trapped in the ear and the homeopathic ingredients help stimulate the body's natural ability to decrease the ear's sensitivity to external factors such as water, cold, and drafts, reduce the clogged sensation in the ear.